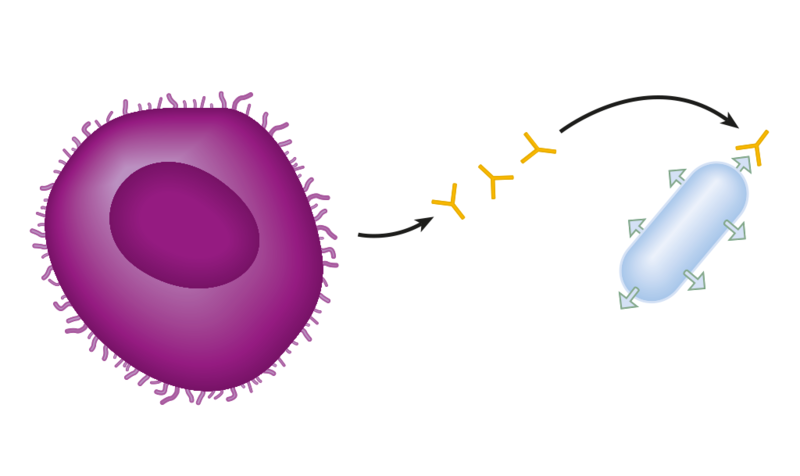 The forked end of an antibody recognises and binds to the antigen on the surface of the pathogen. The third and final line of defence is the immune response. The invading microbe or pathogen is called an antigen. It is regarded as a threat by the immune system and is capable of stimulating an immune response. Antigens are proteins that are found on the surface of the pathogen. Antigens are unique to that pathogen. The whooping cough bacterium, for example, will have different antigens on its surface from the TB bacterium. When an antigen enters the body, the immune system produces antibodies against it. Antibodies are always Y-shaped. It is like a battle with the army (antibody) fighting off the invader (antigen). A type of white blood cell called a lymphocyte recognizes the antigen as being foreign and produces antibodies that are specific to that antigen. Each antibody has a unique binding site shape which locks onto the specific shape of the antigen. The antibodies destroy the antigen (pathogen) which is then engulfed and digested by macrophages. White blood cells can also produce chemicals called antitoxins which destroy the toxins (poisons) some bacteria produce when they have invaded the body. Tetanus, diphtheria and scarlet fever are all diseases where the bacteria secrete toxins. Once the invading microbes have been destroyed the immune response winds down. Once a person has had a disease they don’t normally catch it again because the body produces memory cells that are specific to that antigen. The memory cells remember the microbe which caused the disease and rapidly make the correct antibody if the body is exposed to infection again. The pathogen is quickly destroyed preventing symptoms of the disease occuring.